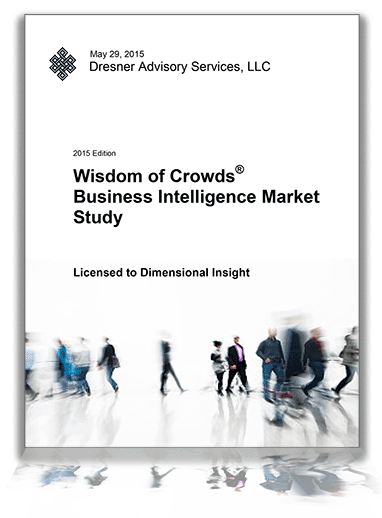 Dimensional Insight, a developer of business intelligence (BI) solutions for complex and highly regulated industries, received the best score for business intelligence vendors in its category in the annual Wisdom of Crowds® Business Intelligence Market Study for the second year in a year in a row. The report which is published every year by Dresner Advisory Services, LLC, an independent analyst and advisory firm specializing in business intelligence and related areas, ranked Dimensional Insight at the very top of the list of among all the 24 vendors included in the survey responded by 1,495 BI users spread throughout industries such as technology, financial services, healthcare, education, and much more. Dimensional Insight received an overall score of 4.61, the highest score in the Specialized segment. The company fared exceptionally well in the categories of “Integrity” (4.83) and “Recommend” (4.80). Dimensional Insight improved its scores for sales, support, and integrity from its 2014 scores. Read the free, 143 pages of the report to learn more about Dimensional Insight exceptional achievement here.